Website traffic has slowed down, page rank took a dive, and Google's been tweeking the index algorithms. Time to rethink the web site format. A word to the wise - refresh your cache to pick up changes. I've always known I had too much info on a page. The whole 'above the fold' deal. Most of the good stuff was not visible on entry - hidden treasures never seen. With this as marching orders, the web site content and navigation has changed and will be changing again as my inclination rises to the challenge. In doing so, I think it's worth some time to point out what's changed with some pictures and a few words. Here's a collection of screenshots with high lights noted by red circles and limited descriptive text. I hope it's interesting and helpful. Regardless, I still feel compelled to write it down. Persistence is a virtue, right? Promotion box Alert shows active promotion codes available in the store. Launches the info when you click it. Mouseover Pop Ups - larger pictures with short text descriptions and fish caught on each model. Slide the mouse over the spinner grids and see larger images. You'll need to have pop ups enabled to use this function. If it bothers you (and it might be a little too much), turn on the pop up blocker on your browser when you see them show up. New pages listed by size and new individual model pages. The size page summarizes each model, the individual pages have links into that model in the web store, and grids showing fish pictures by model. When a size category page launches, the spinners models for the category will be listed in on the left side navigation stack. Each Spinner Model has detail page (or will once I'm finished). Each model has a description and a grid showing a picture, with fish species pictures returned by FCS customers. Each small picture can be clicked to expand it picture on the upper right side. The left side picture has a link to the model in the web store. The size category's models are listed for selection in the left navigation stack. Each size category page has a grid at the top with it's primary models pictures. Each picture has a mouseover pop up that expands into a larger photo. The pop up blocker needs to be disabled if you wish to see these. 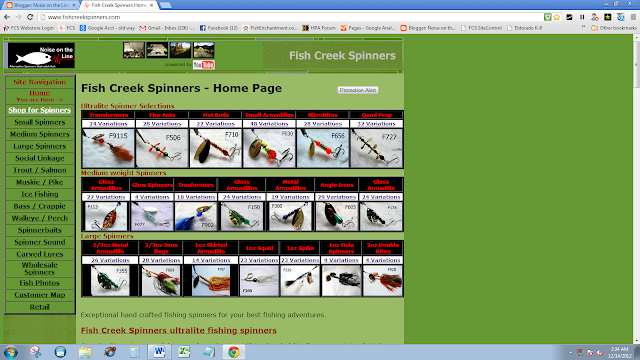 A grid with each spinners picture and fish photo's caught on the model and links into the web store; one as text and one on the upper right spinner picture. By now you've figured out each Model category and each Model detail pages have similar formats, and I'm about done. Oh yeah, one more thing. That's about all I have to help describe the new website changes. 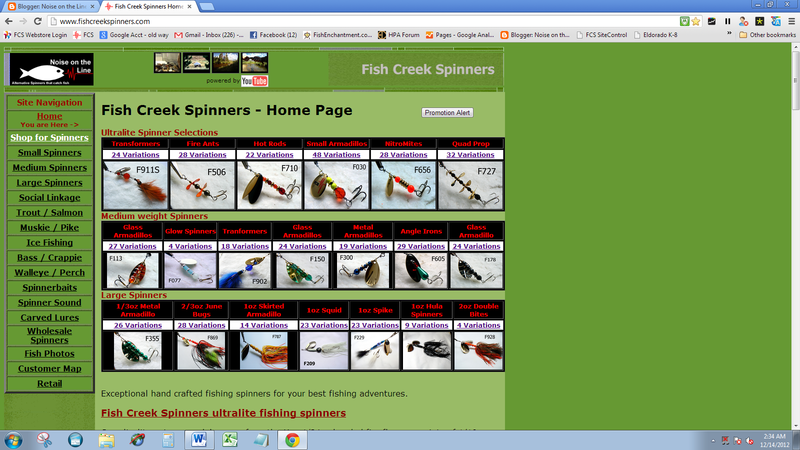 We still have the fish species pages and pages on type classes of tackle - Spinnerbaits, Walleye bait rigs, and trolling cowbells. Either on the home page navigation or on the left navigation in the web store. Hmmm, one last comment. Because content is changing frequently, your launch may not look like these because an older version is being selected from your browser cache. I suggest doing a browser refresh to rebuild the cache and pick up new content changes. This got pretty big and I still have to do the document the web store, oh well, think that will be another post.